There is no streaming. However, they are aired on Jaya TV from Dec. 16 to 31. Please check the Jaya TV website for the schedule. Revanth, thanks for motivating us. We have updated the schedule with the theme. this season nithya shree mam not singing...???? 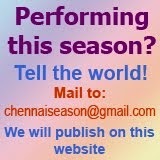 Nithyasree Mahadevn is performing this season. She did here on Dec. 1. Please see the previous post. can anyone tell which is jaya TV's website where we can find the schedules of telecast? can anyone advise which is jaya TV's official website to check the schedules of the telecast? can we know about the day those progs are been telecasted in jayatv??? 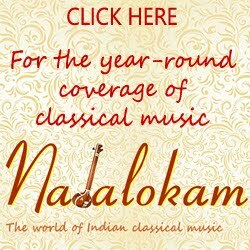 why isnt bombay jayashree had not been singing for the past 2 years?